I am currently teaching a two-part watercolor workshop at McMurray Art League, in Pittsburgh Pa, called "Going Beyond A Likeness". Part one is all about planning. We started out discussing our reference material and why we chose it. We asked ourselves some questions, including "Is it interesting?" and "Can it tell a story, evoke a mood or elicit an emotion?" It is more important to know why you are painting something than what you are painting. We progressed to value studies (below, top row), which are very small, quick sketches to help us identify our focal point and whether we have a variety of values and sizes, movement and best of all, impact. In other words, if this were a finished painting and someone viewed it from across the room, would they feel compelled to come over and look closer? The value sketches are not exactly fun stuff, but they are a very helpful step when composing a painting. Now we've come to the fun part! 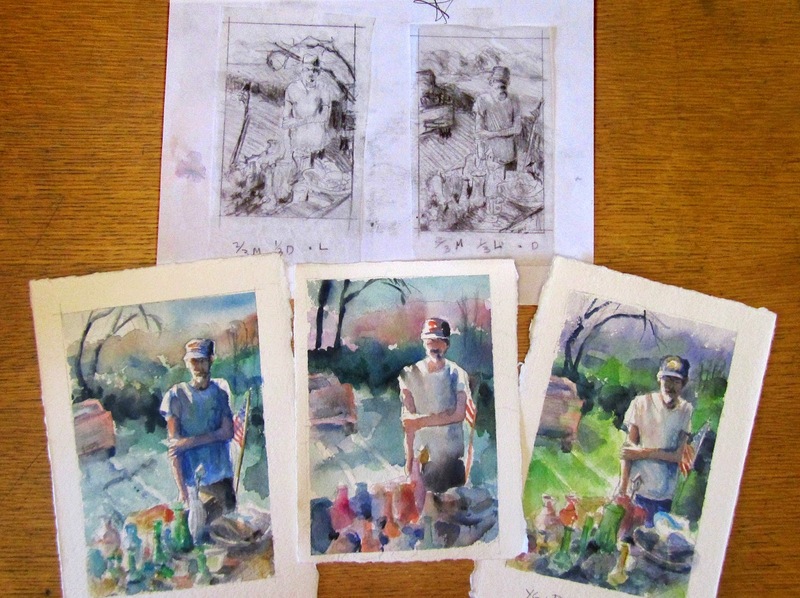 Once we've chosen a value sketch, we progressed to color studies. Each study is small, approximately 5 x 7". Using our Triadic Color Wheel as a guide, we selected several harmonious color combinations and painted 2-3 mini paintings. To break the students out of their tendency to use the same colors over and over, they were encouraged to try new color combinations. Analogous colors are colors which are side-by-side on the color wheel. Complements are two colors that are opposite each other on the color wheel. Tertiary colors are equidistant on the color wheel. I'd like to know, do you use color studies and value sketches in your work? If not, what do you do to plan your painting?